Crisis with phone infrastructure affects Warrandyte businesses and homes. Lines in a plastic bag. Business without phones for over a week. On the weekend of February 11, Troy Hagan Managing Director of Intermax, a company operating out of Husseys Lane, noticed a Telstra contractor re-terminating the cables running down that street. On the Monday morning, he noticed that the work appeared to be only partially completed and the connections were now wrapped up in a plastic bag and secured by tape. Arriving at work, Mr Hogan found that the first of his incoming phone lines was dead. Callers to the business received a ring tone, but the line was not connected. As this was the first line of a rotary group and was not “busy”, the incoming calls did not rotate onto the other lines — meaning effectively the company was unable to receive any calls. This was, of course, immediately reported to Telstra Business Faults and a reference number provided by them. Mr Hogan has provided the Diary with a copy of a long log detailing many calls they made over the course of that week trying to get the issue resolved. He explained that they even persuaded him to enter into an extra contract whereby Telstra would support their NEC PABX system. “This seems to have backfired because Telstra are now blaming the fault on our NEC system, whereas it is blindingly obvious to us that the fault has occurred because of shoddy line work in the street,” he said. The final straw for Mr Hogan was when he received a call from Telstra’s Dandenong Business Centre who said they had tested the line. “They confirmed that there was a fault in that the phone line was no longer attached to the PABX but they could not send out a technician to repair same until we had completed a consent form to agree to pay if no fault was found — and we needed to provide credit card details in advance,” he said. By the end of the week Telstra had finally put a diversion on the number to a mobile phone — so at least the company could receive a single incoming call at a time — even though no-one had appeared to rectify the fault. The following week a technician did finally arrive and said he had been asked to call after enquiries by the Warrandyte Diary. He discovered that the connection was in fact broken inside the plastic bag, so he re-made the connection and installed a proper junction box. Although the Warrandyte telephone exchange is well equipped and up-to-date it is now very clear that the infrastructure of cables in the street is showing its age and is being very poorly maintained, if at all. For instance, the Diary has spoken to the postman covering Research-Warrandyte Road who has an ongoing battle trying to get Telstra to fix a broken pit cover opposite Bradleys Lane, which presents a safety hazard for his motorbike and for pedestrians. The issue is compounded because the support system for faults is simply not working. Many readers tell us of their frustration of trying to get through to Telstra’s call centre in the Philippines to log a fault — and when this is finally achieved often nothing happens. No-one from Telstra phones back and no-one comes to correct the fault, and so the whole process has to be started again. Customers who have left Telstra and gone to another service provider for their landline phone or internet are at an even greater disadvantage, because it is Telstra alone who maintain the infrastructure so the support case has to be forwarded on to them by the other company. In the April 2014 Diary, after many complaints of this type, we advised that Telstra had set up a dedicated team to answer questions regarding issues in the Warrandyte area. To test how this arrangement was working we called the number. The person who answered told us that all the contact details had changed, and that someone would get back to us with the correct details. So the Diary tried the email address previously given for this local support, related the ongoing saga at Intermax, and asked what dedicated local support is available for Warrandyte residents and business (the following day, the technician turned up at Intermax). James Kelly, State Media Manager Victoria & Tasmania at Telstra Corporate Affairs advised the 1800 number and email address previously given to locals was to address a set of very specific problems relating to localised network issues and ADSL availability performance some customers may have been experiencing. “Since that time Telstra has worked to the issues and concerns raised and there are about 581 ADSL2+ ports at the local exchange available for customers to connect to,” he said. Mr Kelly suggested locals can get in touch with Telstra in several ways, including online through telstra.com, Telstra’s Facebook page, and on Twitter via the @Telstra handle, or by calling the Telstra contact centre on 132 200. The closest retail stores are at The Pines in Donvale, or Eastland in Ringwood. For issues relating to fixed lines services in normal operating circumstances, Telstra has in place customer service guarantees for restoration of service; there are various categories and conditions that apply to this but in most cases the response commitments are measured in days rather than hours. Around 50 years of Warrandyte’s sporting history is in jeopardy as the Warrandyte Sports Club upgrades its scoreboard. The old scoreboard, which was reportedly built in the 1960s, was condemned several years ago and the Warrandyte Sports Group has received a $20,000 grant from Bendigo Bank to install a new LED scoreboard to replace it, which is currently under construction. President of the Warrandyte Historical Society, Margaret Kelly, is concerned the community has not been consulted on the fate of the old structure. “It is the only item in the precinct that gives a sense of history, the only visible link with the past, and these facilities are disappearing across Australia,” she said. Treasurer of the Warrandyte Sporting Group John Chapman says the sports club does not have a say in retaining the old scoreboard, as the structure is owned by the Council. The Historical Society has written to Manningham Council, querying whether the structure can be refurbished and moved to the small oval, but they are yet to receive a response. “Hopefully they can relocate it to the small oval. “Too many things in Warrandyte just get torn down,” said Robin Curry on Facebook. The new scoreboard is due to be completed in time for the beginning of the football season and the old scoreboard will be demolished shortly after unless a plan can be made for its refur- bishment and relocation. Saturday Market means the first weekend of the month is always a busy time for Warrandyte, but last Sunday Warrandyte was a-buzz with runners of all shapes, sizes and ages as the Sports Club hosted the annual Run Warrandyte fun run. A slightly overcast morning made for perfect running conditions, the run organising committee were excited to report their best participant numbers ever with over 600 registered runners. The run attracted many regular runners, including the Wooten family who had the whole family at the event. Even the footy players were involved in the action. “It’s a community event so we get the footy players involved in participation, one club one community,” said Pete Muskat, a member of the Warrandyte Football club. super-speedy times set in the four endurance distances. The 15K winner, Brynton Ashton, set a time of 1:02:21 which given the hilly nature of the course is impressive. 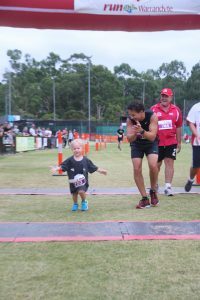 But the day was more about families having fun through exercise, as young Henry Bate (pictured left) demonstrated when he took on the 2.2K run with his family. 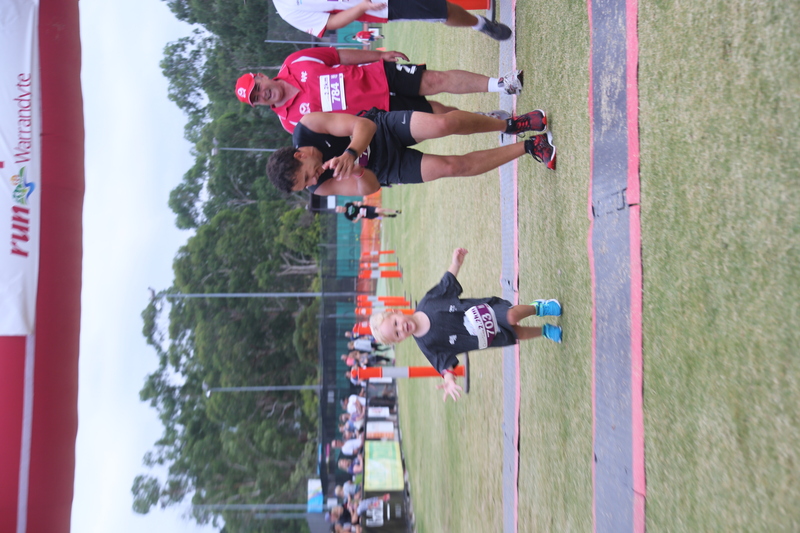 Henry managed to run the course —with the help of his dad— in 23 minutes. This year, as well as the marshals and the CFA, runners out on course were entertained with live music on the corner of Pound Bend Road; volunteer marshal Ben Treyford expressed his delight in having the addition of a live band on course. “They were awesome, we clapped after each song and even the less serious runners had a bit of a dance as they came through,” he said. Run Warrandyte also featured “The Gift” for its second year. once again, a great success and have established themselves as an integral part of the Run Warrandyte experience. 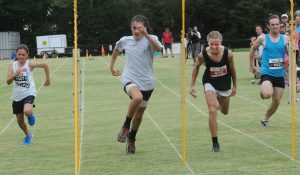 The calculated handicapping by Gift organiser, Peter Sharpe, saw competitors run their hearts out in a thrilling grand final, which saw all seven competitors finish in under 12 seconds. The winner of the Gift was Nicolas Sharpe who ran the 100 meters in 11.335. Commentator Craig Davidson took a few minutes to speak to the Diary and reflect on the event. “As far as coming down here at 6am on a Sunday morning, I cannot think of any other place to be, it’s sensational. Our Diary photographers were out and about on the day taking some awesome snaps of the running action, check out our Run Warrandyte page on the Diary website for a selection of pictures from the event. 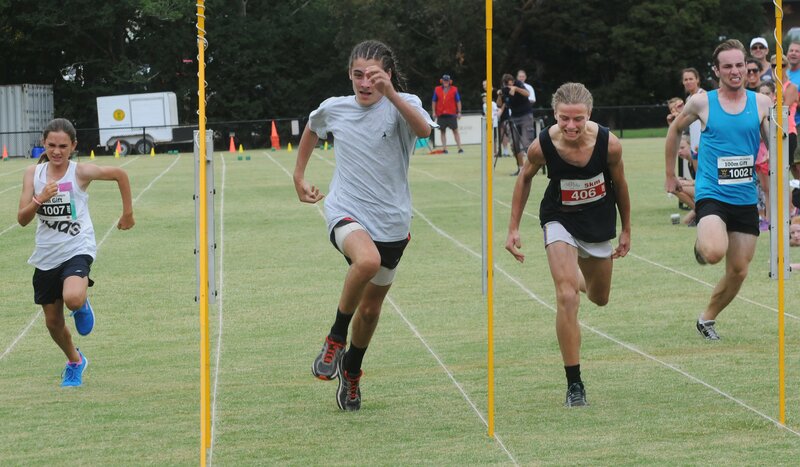 Full race results for the endurance distances can be found on the Run Warrandyte page of the Warrandyte Sports Club website.